13 in x 9 1/2 in. Leslie Wayne (born 1953 Landstuhl, Germany) is an artist based in New York. Wayne has an unconventional way of approaching painting by taking it as a sculptural material. She does this by scraping, folding, cutting, and building up the surfaces of each piece. 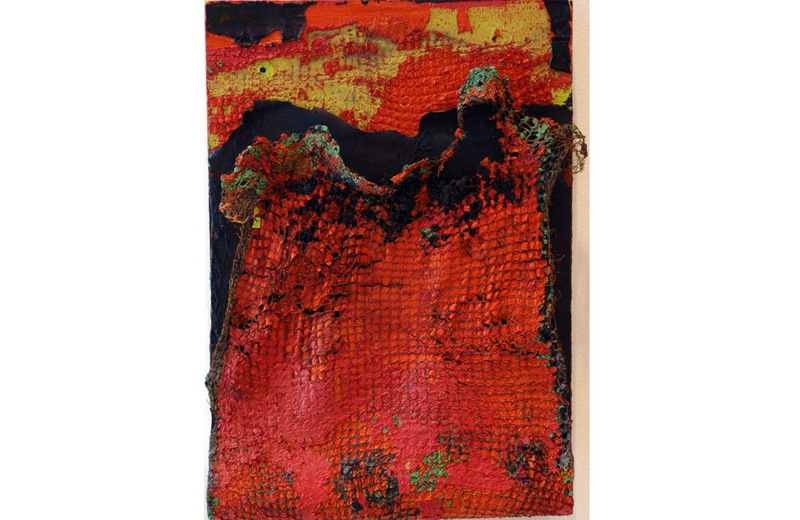 Her work consists of textures, layers, and the interaction of color. The theme that she always finds inspiration on is landscapes and organic shapes. The Edges of Night is a three dimensional abstract painting. This work is inspired by the organic movement of various landscapes. The black and red paint gives the work a powerful presence that represents the force of the night. Layering of paint and a net-like material was used to create its three dimensionality. The most prominent colors of this artwork are red and black, with the red being the one that covers more surface. The layering goes from black to red twice from front to back, exposing a small section of each layer starting from the top left corner. The two red layers contain a texture created by some sort of net-like material. The front red layer is still fused with said so material.